The verbal section - I'm all over that. But the math? 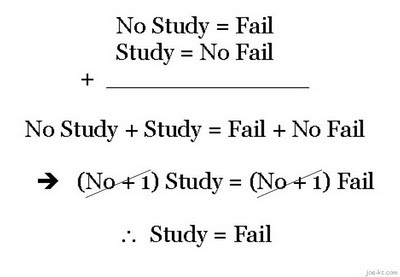 Let's just say I'm liking this equation more and more. Yep. I took the GRE when I was finishing my BA with the intention of continuing to an MA, but... then I got married, etc. So now we've found a small window of opportunity in our crazy family/academic/work life and I'm going back to school - MA in English. Unfortunately, it's been 6 years since I last took the GRE, so I have to do it again. (sigh) Wish me luck!